Home > Review	> From Dust: Just a god game or the god of games? From Dust: Just a god game or the god of games? From the moment you begin, From Dust strikes as an increadably well devised and expertly polished game. Acting the part of a god you pick up powers throughout the game which amplify and enhance your ability to change the landscape. These vary from being able to ‘jellify water’ so as to re-enact the biblical parting of the red sea; to being able to create ‘infinite earth’ or summon a black hole to ‘engulf all’ allowing you to completely adapt the world to suit your people. But don’t let these powers lull you into a false sense of security… There are disasters aplenty to keep things interesting. There are volcanic eruptions and lava flows, there are tidal waves and flash floods, there are earth collapses, there are trees that set fire to everything, trees that flood everything, TREES THAT BLOW UP EVERYTHING! Each different level concentrates on a different aspect of gameplay and introduces some new obstacle or tool, meaning that the gameplay is widely variable and fairly original. Everything from the opening clip through the training is fantastically put together – with not too slow nor too fast a pace to pick up what’s going on. Then once all of your abilities are revealed to you and put to the test, you are in no way let down. There is a perfect variation in situations and abilities throughout the levels, always with more than one thing to keep you occupied including a few disasters to avoid at any one time. 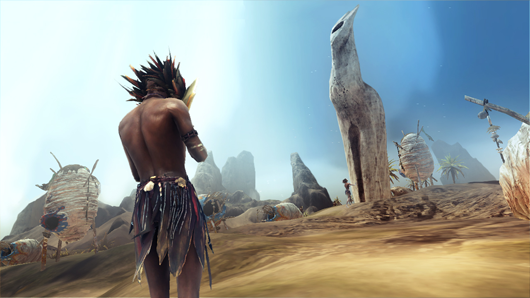 You begin the game with a tribe which you have to lead to safety using the abilities of “the breath” – a god-spirit similar to “the hand” from Black and White. To start with, you need to do nothing more than move dirt about to protect and help them, but as the game advances, more can be moved and manipulated. 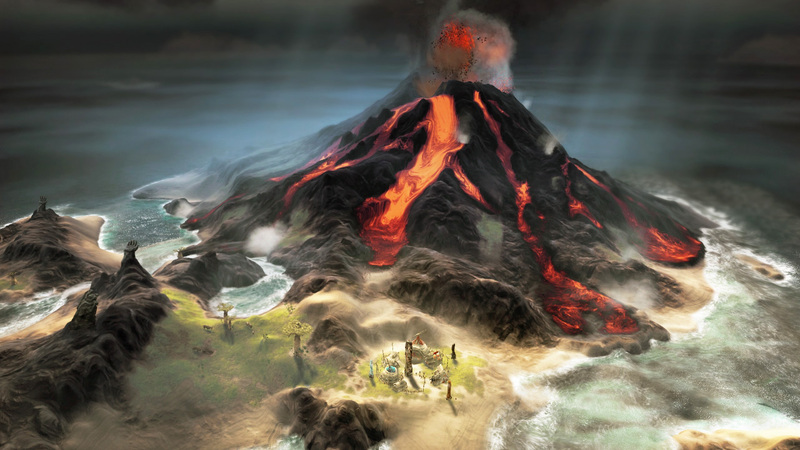 Lava can be used to build walls, water must be removed to prevent them from drowning, various special trees can carve out the land or set fire to it and villages may be moved to safety if a natural disaster threatens. The combination of these aspects leave you with beautifully balanced gameplay, constant dangers to keep it interesting but enough powers to keep it from being a frustrating slog. 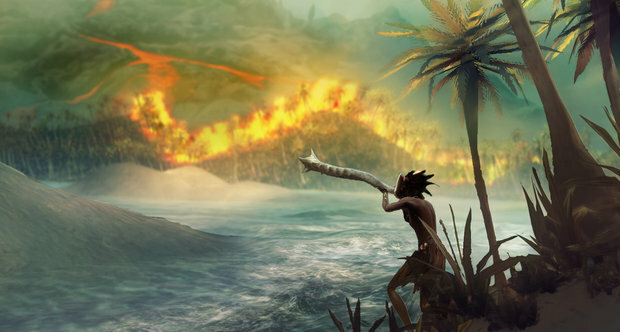 There is also a library of information “the memory of the tribe” which is expanded as you collect various pieces of information throughout the game. This as with the rest of the game is nicely done, with the information you need on a certain subject mixed in with the history as if told by a story teller. This along with the non-english muttering thoughout the game and the xylophone notes playing as you navigate the menus gives a distinctly tribal feel to the game. As you may be able to see from the above, I do love this game. I found it very hard to fault it at all infact, but I managed – do not fear. The one frustrating aspect is infact the tribes themselves. As you send them out from their villages to populate new areas or capture increadable powers, they seem to have an uncanny ability to become stuck. This is obviously intentional to an extent since they cannot cross water or climb too steep an incline, but it definately takes away from the game as you spend hours pampering them with smooth sloping sand dunes and stream-free grassland only to see them unable to cross part of it because you’ve already died of boredom. Really I’m being too harsh on this, it’s only a minor part to the game and only once did it cause any real annoyance. So from dust: is it a god game or the god of games?… Well obviously it’s a god game, that was really just to make the title catchy. But in all seriousness it is a fantastic game, and despite all of the previous online/offline problems for computer users, it is very well made indeed. I would say that you should try the demo, but I won’t. I will say: buy the game, seriously, it’s not even that much and it was for me, time well spent. Retrospectacles: Casual Gaming (a.k.a. The jeans and shirt combo of video games) Happy Birthday Team Fortress!